Many people say that they would like to consider metal tiles as an option for their ceiling, but they feel as though the transition between the tiles and the wall would be unsightly. However, this is, unfortunately, a common misconception! With tin ceiling crown molding, it’s actually very easy to blend your new tin ceiling tiles into your existing wall structure. Tin crown molding is also an excellent option because it comes in more styles, and is more affordable than wood. Its most significant selling point, though, is the fact that it is easy to install. 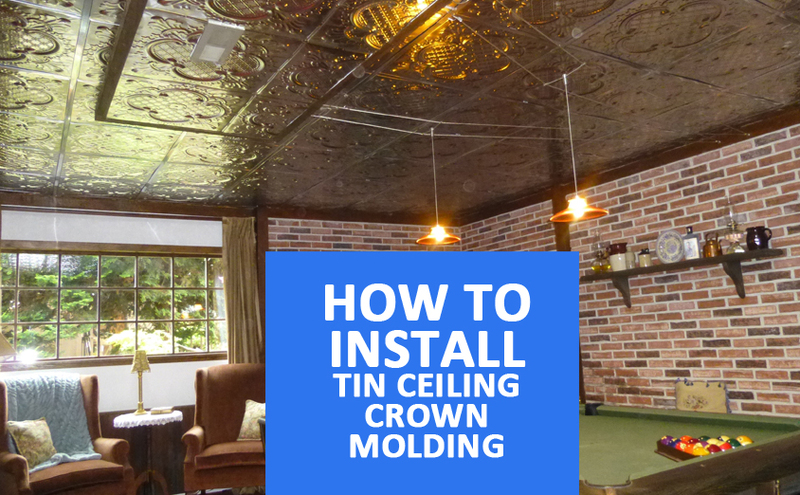 Below, you’ll find a guide on how to install tin ceiling crown molding. First and foremost, it’s essential to measure and prepare to fit your tin ceiling crown molding. Most crown molding sticks out 3” from the ceiling and extends 3” down the wall. The molding often sits at a 45-degree angle. But, this could vary depending on what type of tin ceiling crown molding you purchase. Use a level to draw a guideline for your bottom edge. Make sure you start by installing the crown molding in a corner. Make sure that the piece aligns with the bottom edge of the guideline. Attach the molding by using fasteners every 6”. Add the fasteners to both the top and bottom nail rails. Repeat this process for additional pieces of crown molding. Each piece of molding should overlap by ¼”. Continue installing crown molding until you reach the corner of the wall. Then, be sure to use molding with factory-mitered edges so that the corner pieces can fit into each other seamlessly. Use caulk and spray paint to mask any gaps in your crown molding. You can likely find painter’s caulk and spray paint to match the color of your crown molding. Also, consider using these materials to cover over punctures made by nails as well. If you’re looking to make a statement with your crown molding, consider adding flat molding beneath the crown molding.